What do you get when you combine time travel, intriguing literary history, Paris, and romance? Why, Cynthia Morris’s novel, Chasing Sylvia Beach, of course! Cynthia is a well-known and expert writing and creativity coach. 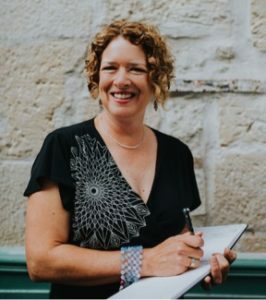 Through her business, Original Impulse, she offers online workshops, individual coaching, books to help your creative practice, and travel opportunities. Based in Denver, Cynthia leads courses in Paris quite often, leading other creative spirits through the streets of her favorite city as they create illustrated journals. But Cynthia is very much a writer in her own right. Can’t travel to Paris with Cynthia? No worries. You can get an intimate look at the City of Light through Cynthia’s 2012 novel, Chasing Sylvia Beach. Sylvia Beach was, of course, the owner of the famed Parisian bookstore, Shakespeare and Company. Cynthia makes Beach’s 1930s Paris accessible to us nearly a century later with the magical twists and turns of highly delightful time travel. When Denver bookstore clerk Lily Heller visits Paris in the present day, she’s captivated by the history of the city, especially all the literary lore. She imagines all of the ex-pat Americans writing and mingling on the Left Bank, often at Shakespeare and Company. How perfect, then, when Lily slips through a crack in time and finds herself in the 1930s Paris she’s been dreaming of. As she clatters around Paris on her bicycle, we hold our breath with her as she encounters one amazing historical person after another and let it out again when she lands a job at Sylvia Beach’s bookstore. Before long, Lily’s got a romance on her hands with Paul and a mentor in Sylvia Beach. Will she ever want to step back through the crack in time and return to her life in twenty-first century Denver? You’ll have to read Chasing Sylvia Beach to find out where Lily’s adventures lead her. As you join her on the streets of Paris, you’ll feel like you’ve been transported back in time as well. Learn more about Sylvia Beach at the Shakespeare and Company website. You can also learn why Cynthia has been obsessed with Sylvia Beach for years – be sure to check out the video of Cynthia talking about Beach! And if you’re an aspiring or experienced writer, artist, or some other kind of creative spirit, consider joining Cynthia for one of her many offerings. Visit Amazon to buy your own copy of Chasing Sylvia Beach or stop in at Cynthia’s online shop and the Original Impulse library for resources that will nurture your creative life. Listen:Listen as Cynthia Morris reads from Chasing Sylvia Beach. Image credit: Photo courtesy of Cynthia Morris.